The Charlotte 49ers women's basketball team is adding some more local talent. 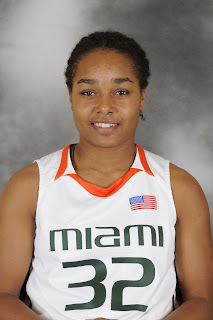 Former Providence Day standout and Mecklenburg County player of the year, Epiphany Woodson is transferring to Charlotte from Miami (Fla.) She will sit out the 2009-10 season per NCAA rules and have two years of eligibility remaining. At Miami, Woodson scored 328 points, had 120 rebounds and 106 assists in two seasons. She recorded 14 double-figure scoring games including 10 double-figure scoring games against ACC competition. Aston said Woodson will add needed depth to the 49ers' roster of guards. “It was a surprise addition that I think the community of Charlotte will be thrilled about considering she is a Charlotte native and had a tremendous high school career at Providence Day," Aston said. "She has experience at the college level that will help our program continue to grow. Again, I can’t tell you how excited I am that we are continuing to attract Charlotte players." At Providence Day, Woodson led her team to three straight North Carolina Independent Schools Association state championships. She was named Mecklenburg County Player of the Year as well as to the All-Observer team, first-team All-Mecklenburg County and second-team N.C. AP all-state. Woodson will take the roster spot of redshirt freshman Brittany Carter who has left the team due to medical issues. Carter saw action in 27 games over the past two seasons. She played the two best games of her career in the Atlantic 10 Tournament when she recorded back-to-back double-figure scoring games in wins over Duquesne and Temple. Charlotte won its first Atlantic 10 Conference tournament title this season and advanced to the NCAA Tournament for the second time in school history, losing to Purdue in the first round. WOW! This is a HUUUUGE pick-up!! Next years lineup will be LOADED!! GREAT JOB BOBBY LUTZ & CO.!!! THE 9ERS COME FROM LAST TO FIRST! LOOK OUT A-10!!! Oh... She will play for the womens team...?? Sorry, I really dont know anything about the recruits we get. I just like to take any available opportunity to slobber on Lutzs slong. I wonder if Meyer and she didn't hit it off.